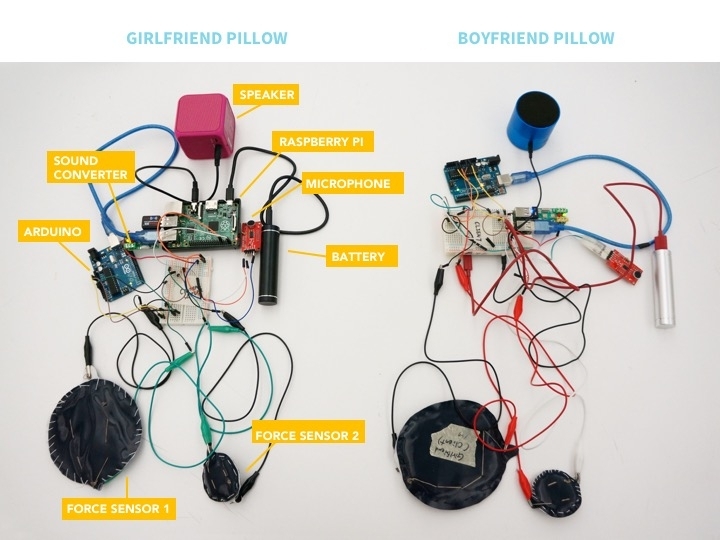 Bedside Whisper is a wireless pillow that allows long distance couples to share voice messages and store their intimate thoughts in a private website. The pillow aims to enrich long distance relationships by creating a sense of physical presence of your loved one in bed. Communication technologies have continued to dissolve the spatial proximity between people. Sure, we can connect with people in different time zones through Skype, texts, or Facebook chat. But what do we miss? Glitched video chats only make you yearn for real-life interactions all the more and delayed messages can lead to miscommunication. How can technology be used to strengthen human intimacy and communication for long distance relationships? Using capacitive thread and Velostat, I made 4 force sensors (2 large sensors, 2 small sensors). The large sensors trigger recording, and the small sensors plays back your most recent recording. The Arduino reads analog values from the force sensors and feeds it to the Raspberry Pi. When the Raspberry Pi detects a pressure larger than a certain value, it activates recording. Using Node.js, the pillow stores the recording file, date of recording, filepath of the recording in its local server. By using TCP, I created a network between two Raspberry Pis so the two Raspberry Pi can access a central server where the recording information is stored. The recording information is then pushed to a Parse database and retrieved through an encrypted website shared between lovers.